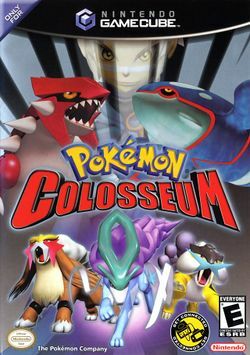 Pokémon Colosseum (Pokémon Koroshiamu) is the first GameCube incarnation of the Pokémon video game franchise. It follows the idea of the Nintendo 64 Pokémon Stadium video game series. The game was released in Japan on November 21, 2003, and was released in North America on March 23, 2004. It was released in Europe on May 7, 2004. It has since been followed up by Pokémon XD: Gale of Darkness, a 2005 sequel to this game. Pokémon Colosseum puts significantly less importance on the non-RPG aspects of the game than Pokémon Stadium and Pokémon Stadium 2. For example, there are no minigames, nor is there a Gym Leader Tower. While it is the first 3D Pokémon video game with an RPG mode, it doesn't allow the player to use rental Pokémon the way the Pokémon Stadium games did. This was probably done because Pokémon are obtainable in the RPG mode, thus most of the features in the game are still usable without a Game Boy Advance Pokémon game or rentals. This title features support for the Pokémon Ruby, Sapphire, Emerald, FireRed and LeafGreen games. It features all 386 known Pokémon as of the 3rd generation. The game feature a first for the Pokémon series, a true 3D role-playing game mode that allows the player to capture Pokémon that cannot be captured in Ruby and Sapphire, allowing them to eventually be transferred into said games. This includes Legendary Pokémon such as Ho-Oh. It also adds a new Pokémon status, Shadow Pokémon, which cannot be traded to any game until they lose their Shadow status. This page was last edited on 2 March 2016, at 01:57. This page has been accessed 27,931 times.